Expect the unexpected: Our book was not intended to become a movement. We all put the work in to produce a book that we were proud of. We had no idea that it would grow into what it has become. As part of my series about “How to write a book that sparks a movement” I had the great pleasure of interviewing Dr. Amber Robins. Dr. Amber Robins who is family medicine doctor practicing in Washington, DC. Dr. Robins had the idea of bringing women in medicine together to tell their stories in a book called “The Chronicles of Women in White Coats”. In the book, twenty female doctors from around the country open up about the realities of working in medicine. Each author opens up about her challenges while being a doctor to patients. Whether they are providing aid in disparate communities, breaking gender barriers or glass ceilings, collectively they choose to speak up about their experiences for the future of female health professionals. At our their book launch, it was clear that a movement was forming. From the book, a facebook group and website WomeninWhiteCoats.com was formed. 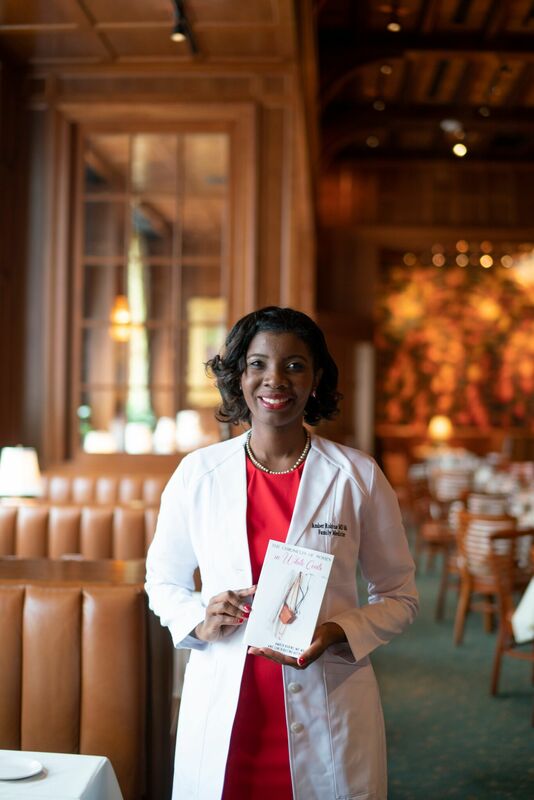 Just a year after launching “The Chronicles of Women in White Coats”, Dr. Amber Robins along with the 19 authors will have their first conference and wellness retreat at Chateau Elan near Atlanta. There they will be honoring 20 amazing female doctors who were nominated by their peers for the amazing work that they do. I grew up in Louisiana with two loving parents. My mother was a mathematics professor at a at a local university and my father was a retiree from Exxon. During my childhood, I was able to see the medical field in person as my father was in and out of the hospital over a four year period. His experience showed me the impact that medicine could have on the lives of patients and their families. Growing up I also viewed TV shows about doctors and began to dream that I would one day be one. My favorite book was “Amazing Grace”. It was a book about a black young girl who could accomplish everything that she put her mind too. As a African American girl myself, it really opened the doors to me knowing that one day I would achieve my dreams of becoming a doctor. After the grueling hours of residency and fellowship training, I would go to several female doctor social media groups where I would see pictures of other women doctors who knew what I was going through. I began to have the goal of bringing all the topics that we spoke about in these groups and put them in the form a book. Nineteen courageous women joined me in this journey to create “The Chronicles of Women in White Coats”. As a female doctor, I also did not hear many telling our stories in the general public or in media. On TV there are shows like Grey’s Anatomy and The Resident which are entertaining to watch, but the shows don’t accurately show the real life experiences of women in medicine. Our stories of dealing with gender pay gap, gender bias, and balancing home life and work are stories that don’t get much attention. Our book is a way to get a real good look at the lives that women in the healthcare field actually live. One of my goals when putting together the book was to target young girls to better understand the real stories of women in medicine. These women are the unsung heroes around us. I wanted the world to know about these amazing women and all that they go through in order to care for their patients and families each day. I also wanted to target medical professional students, both men and women, along with our colleagues to spark a conversation about our unique experiences in medicine. The results of this book being published have been beyond what I initially dreamed. My goal was to simply publish the book. I was amazed when it forged a much needed movement to talk about hard topics like #metoo in medicine and burn out. We are now one of the growing voices for women in healthcare. Once we had the website that was based on our book up and going, we started seeing we were getting lots of traction. Then we started hearing from our viewers that they wanted even more. This sparked us to create a podcast, conference, and Women in White Coats Heroes Awards Dinner. Our conference and awards dinner will be held in April 2019 at Chateau Elan. The fact that we were able to do all these things in less than a year helped me realize that we had created something special here. We now have reached over 70,000 page views for our website that launched in September 2018. We also are growing our social media groups and are working on creating courses along with support groups for women in medicine. We hope to expand beyond helping just doctors and include all women in the healthcare field. Once the book was published we received many rave reviews from both women and men in medicine as well as from those aspiring to get into healthcare field. The most touching part is seeing the power of our stories. The doctors in “The Chronicles of Women in White Coats” chose to tell their own stories and be unapologetically brave about gender barriers. All the authors chose to have tough conversations regarding the experiences of female professionals in medicine and dentistry that many people aren’t comfortable talking about. From the #MeToo Movement to motherhood, each contributing author had their own individual perspective yet collectively we were able to share the same mission. With each story, we hoped to prepare others for the unexpected challenges of life from within the medical profession. Many of the authors in “The Chronicles of Women in White Coats” were also first time authors. I have had the pleasure of seeing them grow as advocates and ambassadors for women around the country. I also have been encouraged with the responses we have been getting from our readers. We have been able to reach women who may have felt alone in their experiences. It excites me to know that we now have the ability to let these women know they are not the only ones who experience tough times in medicine. I am so proud that we have been able to create a support system for many women in healthcare. Being able to manage the book that has led to the Women in White Coats movement has been difficult at times. We have had some bumps and bruises in learning to get our story out to the public. For women in healthcare, it can be make our lives a little busier as well. However, I have found that I not only get rewarded from serving my patients, but now I am privileged to serve my fellow colleagues in this unique way. I think books can help start conversations around particular topics that people may feel uncomfortable talking about. Our book helped point out several key topics that are just starting to be discussed in healthcare like gender bias and pay gap. The book also helped all the authors see that our stories do matter. Our goal now is to empower other women in healthcare to see that their stories can do the same for others. I think that persistence and creativity helped birth this project that has now created a movement. It is not easy to go to work where I see my patients and then come home to work on the book “The Chronicles of Women in White Coats” and now the growing brand of Women in White Coats. With that said, it was all worth it! I look forward to seeing what Women in White Coats will become. Everyone will not get the vision of what you are trying to achieve. We did have some critiques and even some self-doubt among ourselves trying to figure out if we could actually publish the book or even be bold enough to spark a movement. Well, we were able to do that and more. Our hope is to continue to grow into a household name for women in the medical field. 1. Expect the unexpected: Our book was not intended to become a movement. We all put the work in to produce a book that we were proud of. We had no idea that it would grow into what it has become. 2. Timing is everything:Our book came out during the time of the #metoo movement along with lots of other women empowerment movements. Our book naturally fell in line with these narratives which resonated well in the general public. This helped us in pushing our narrative to the masses. For those interested in bringing their book to forge a movement, it is key to know what is going on in society because it can help amplify your book and your voice. 3. Be prepared to build a brand: After the book was published, we had to come up with a website and appropriate branding that we thought would work best for us. We used our book as a foundation to build on. Many of the topics in our book we still use as part of our online website at www.womeninwhitecoats.com.We are now developing more programming to expand our reach even more. 4. Be Patient:Sometimes putting together a book that leads to a movement takes time. We did not want to rush the process, but grew as our following grew. Be patient and make sure that whatever your come out with is in line with what your book and your growing brand represents. 5. Have fun during the journey: This has been an exciting time for Women in White Coats. We have learned so much about each other and have enjoyed inspiring women across the world. It’s been a great ride so far and we intend to keep growing to reach more women. We are excited about meeting many of our readers in person at our conference and wellness retreat from April 4–6, 2019 at Chateau Elan. If you are interested in joining us at this event or others in the future, go to our website at www.WomeninWhiteCoats.comto find out more details. My next “movement” would be to help people better care for themselves by choosing a healthy lifestyle. As a doctor, I emphasis this on a daily basis. My goal is to give patients back power over their health. You can purchase our book on Amazonor on our website.